Postponement of the Dinner to the Earl of Surrey. The Stewards for managing the Dinner intended to be given to the Earl of Surrey, present at a Meeting held this day, having ascertained that in consequence of the sudden death of Sir Richard Jones, a great many of Lord Surrey’s Friends, resident in Worthing and its immediate vicinity, would feel themselves constrained to absent themselves from the dinner, out of respect to the memory of Sir. 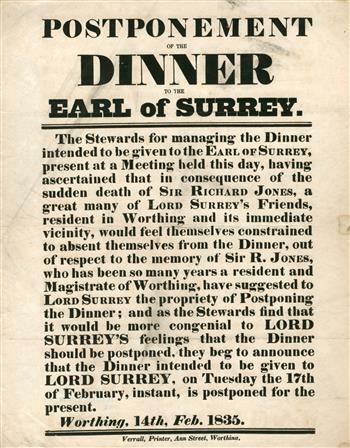 R. Jones, who has been so many years a resident and Magistrate of Worthing, have suggested to Lord Surrey the propriety of Postponing the Dinner; and as the Stewards find that it would be more congenial to Lord Surrey’s feelings that the dinner should be postponed, they beg to announce that the Dinner intended to be given to Lord Surrey, on Tuesday the 17th of February, instant, is postponed for the present. Verrall, Printer, Ann Street, Worthing.